Buzz will soon support Personal Needs and Preferences (PNPs) and Individualized Education Programs (IEPs)! On Thursday, February 23, 2017, we are introducing Personal Needs and Preferences (PNP) and Individualized Education Program (IEP) functionality. 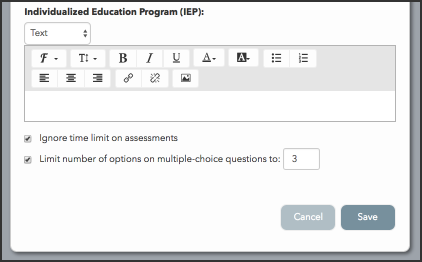 IEPs/PNPs can be created and edited exclusively in the Admin app. Retire the current File Note behavior, as the IEP makes it unnecessary. Add an IEP text editor to the Edit User popup. Teachers have read-only access to IEPs. 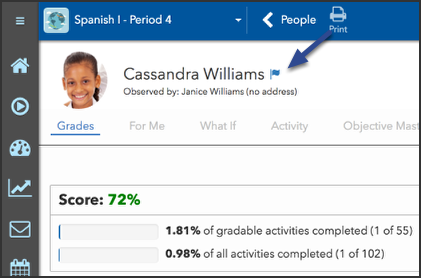 When the column is made visible, an IEP indicator (flag) icon will appear next to students with IEPs in the People and Performance tools. 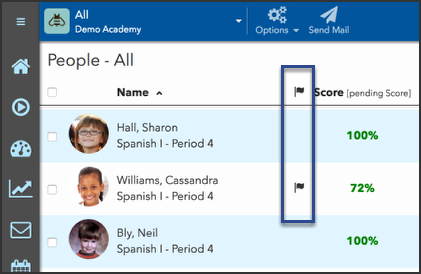 An IEP indicator (flag) icon will appear next to the student name in the Student screen (access by selecting a student from the People and Performance tools). Teachers will click the icon to access the read-only IEP (as they currently do with File Notes). Is it possible for teachers to make the modifications for a specific student and specific course? For example, if a student has three different teachers can each teacher choose to reduce the number of MC questions? Instead of having an admin have control of these modifications it may make more sense for individual teachers make the accommodations.